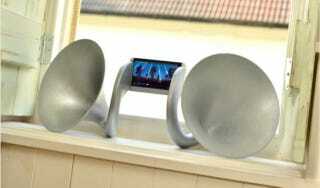 If you're looking for particularly decadent accessory for your HTC One, perhaps you'd be interested in a wonderfully elaborate gramophone-inspired passive speaker? If you've got $8,000 lying around, at any rate. Designed by Justin Wolter as part of HTC's push for more creative design, it's actually called the Gramohorn II. No electronics are involved: it simply amplifies the sound by taking the output from the HTC One's (actually quite good!) speakers and focussing it more effectively.